THREE MONKEYS STAGED an escape at Dublin Zoo after Storm Ophelia blew the roof off a section of their enclosure last October, newly released records have revealed. The three juvenile Sulawesi crested macaques jumped 20 feet from a climbing frame in their habitat onto an electric fence overhang, before running riot in the zoo grounds. The zoo was closed at the time of the incident, meaning there were no visitors on site. A zookeeper noticed that the monkeys were missing when he checked the enclosure at 9am and raised the alarm. An emergency team immediately responded and located the three fugitives hanging out in a tree close to their habitat, around 65 feet off the ground. The area around the tree was secured and a cherry picker was deployed to the site. Staff attempted to shoot the macaques with tranquiliser darts from the cherry picker, but this proved unsuccessful due to high winds and tree branches that prevented the marksmen getting a clear shot at the monkeys. According to an incident report released under the Freedom of Information Act, zoo workers were instead forced to pull back from the tree and wait for the animals to climb back down to ground level in their own time. They eventually made their descent at around 11am, at which point one monkey was caught using a net. The other two initially evaded capture but were subsequently darted and sedated. All three were examined by a veterinarian and returned to a secure area within their habitat, bringing their adventure to an end. 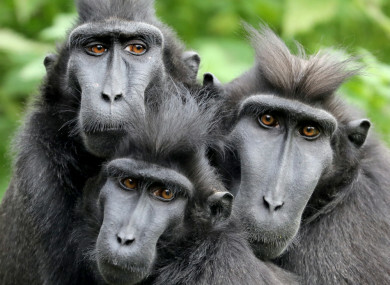 A subsequent debrief noted that there had been an “excellent response” from zoo staff, who attributed the escape to anxiety amongst the macaques as a result of “the previous evening’s wind”. In response to the incident, Dublin Zoo undertook to repair the macaque house that had been damaged by the storm, as well as shortening the climbing frame that had been used by the monkeys to escape. Keepers said that the electric fence overhang had been “working perfectly” when it was checked that morning. It was decided to reinforce the fence with added earth wires. It was not the only time last year that macaques made a break for it at Dublin Zoo. In May, a staff member at the entrance of the zoo called security after spotting a juvenile monkey in a flower bed opposite the front gate. Visitors were temporarily stopped from entering the zoo, and security maintained a cordon around the macaque house, according to an official report of the incident. An emergency team responded with catching nets but, when they arrived at the scene, security advised them that the macaque had already jumped back onto the island from the roof of the house. A subsequent debrief could not establish how the macaque had managed to leave his habitat. However, it was decided that the water moat around the island should be made wider and deeper to prevent any further escapes. Sulawesi crested macaques belong to a critically endangered species of monkey, which can grow to 60cm in height and can weigh as much as 10kg. Another Irish zoo, Fota Wildlife Park, experienced similar problems with the species in 2015 when a macaque called Stevie Wonder successfully escaped from his enclosure four times. Email “Three monkeys staged an escape from their enclosure in Dublin Zoo during Storm Ophelia ”. Feedback on “Three monkeys staged an escape from their enclosure in Dublin Zoo during Storm Ophelia ”.